Known As "The Pickering Treaty"
Red Jacket, and Handsome Lake. President George Washington signed at bottom. The land of the Seneca Nation is bounded as follows: beginning on Lake Ontario, at the northwest corner of the land they sold to Oliver Phelps; the line runs westerly along the lake, as far as Oyongwongyeh Creek, at Johnson's Landing Place, about four miles eastward, from the fort of Niagara; then southerly, up that creek to its main fork, continuing the same straight course, to that river; (this line, from the mouth of Oyongwongyeh Creek, to the river Niagara, above Fort Schlosser, being the eastern boundry of a strip of land, extending from the same line to Niagara River, which the Seneca Nation ceded to the King of Great Britain, at the treaty held about thirty years ago, with Sir William Johnson;) then the line runs along the Niagara River to Lake Erie, to the northwest corner of a triangular piece of land, which the United States conveyed to the State of Pennsylvania, as by the President's patent, dated the third day of March, 1792; then due south to the northern boundary of that State; then due east to the southwest corner of the land sold by the Seneca Nation to Oliver Phelps; and then north and northerly, along Phelps' line, to the place of beginning, on the Lake Ontario. 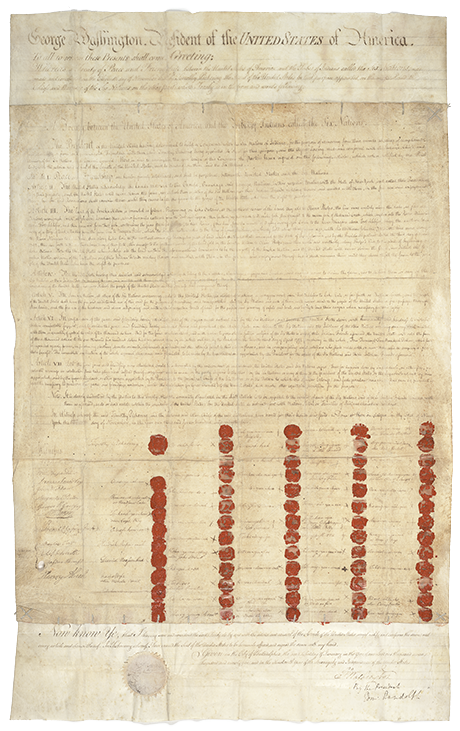 Now, the United States acknowledge all the land within the aforementioned boundaries, to be the property of the Seneca Nation; and the United States will never claim the same, nor disturb the Seneca Nation, nor any of the Six Nations, or of their Indian friends residing thereon, and united with them, in the free use and enjoyment thereof; but it shall remain theirs, until they choose to sell the same, to the people of the United States, who have the right to purchase. Credits of this article taken from the Canadaigua Treaty 1794. Brother, we the Sachems of the Six Nations will now tell our minds. © 2018 Seneca Media and Communications Center. All Rights Reserved.